Online ordering system for your restaurant? 7 reasons why it's a good idea. 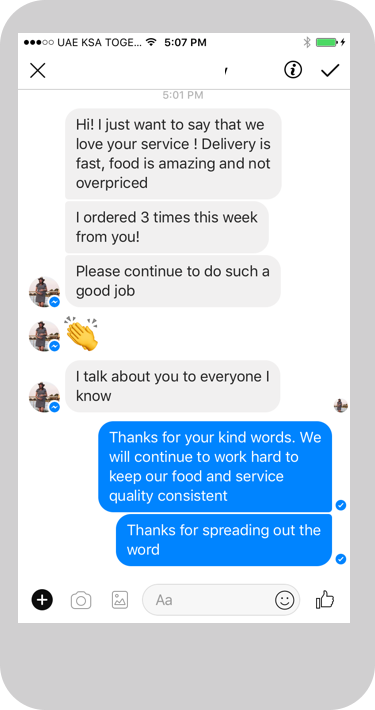 Last week, I discussed with a great family owned pizzeria in Dubai about having their own online ordering system. With so many Pizza places now listed on food portals, they were not visible anymore. Even worse, to rank better they were asked to pay extra fees on top of the already high ones they give away on every order. They were then looking into setting up their own online ordering system for their pizzeria. Here are 7 reasons why it’s a great time now for restaurants to think about having their own food online ordering system. Be independent: Having your own stream of online orders helps you to be in better control of your business. The food online ordering market is growing fast but when you only rely on aggregators, you’re dependent on someone else to grow your business. If their algorithm decides to rank you at the bottom of their app. Your flow of orders will suddenly drop and leave you with no other option than to pay more to go back up. This can hurt your business a lot not mentioning the stress it will create. Your own food online ordering system is the key to balance your revenues, have more visibility, stability and peace of mind. Save money: It’s definitely one of the main reason why it’s worth looking into having your own online ordering system. Setting it up is easy and affordable and you will save money on every order. In most case, you will make twice more money than for the same order from an aggregator. As you will not pay the fees they charge you for every order. It’s especially true for your loyal customers where you should not pay fees every time they order. The 2nd great advantage is often a forgotten one. You are boosting your negotiation power against aggregators. Now you have an alternative, now you can grow your business without them. So, to work with you, they will need to adjust to your conditions and not the other way around. In many cases, business with their own ordering channel manages to drive down aggregators fees by several %. It can make a huge difference on your bottom line at the end of the month. Get more negotiation power vs food ordering portals. Google Algorithm change: Having my own ordering system? Great idea but it’s so hard for people to find my website or Facebook page. They need to go through so many links with my business name from aggregators. That’s true but it’s changing. Deliveroo, Uber Eats, Zomato, … are big guys. But the even bigger guys Google and Facebook are realizing that aggregators’ ambush tactics have created a bad user experience on their platform. Google knows that when someone types your restaurant name, it’s because he wants to get in touch with you directly. He doesn’t want to land on another company website. So Google and Facebook are changing their model to put your restaurant first, especially on mobile. 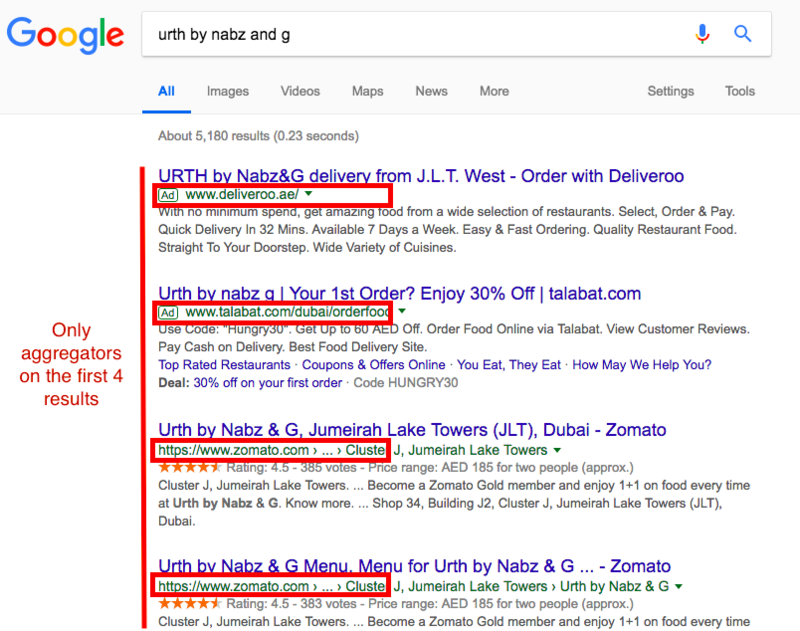 Here is how the same search looks on mobile and desktop for a classic restaurant when you have optimized your Google presence on mobile: Urth by Nabz & G.
Aggregators are killing restaurants SEO on desktop. 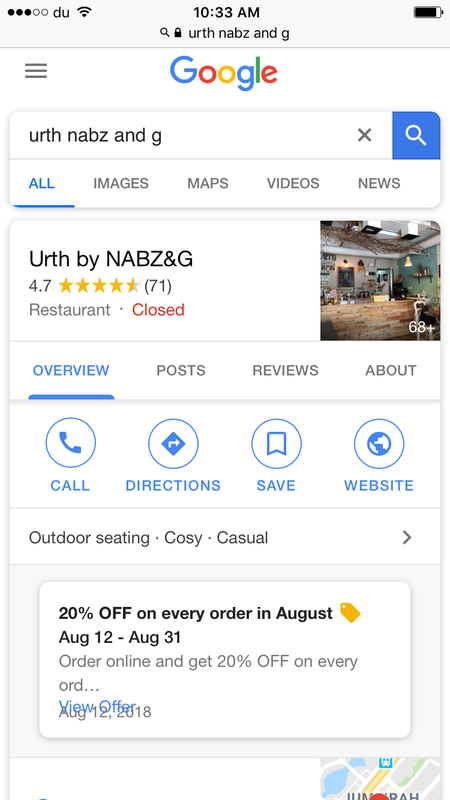 Google is connecting you directly with restaurants on mobile. Customer Loyalty: What’s the most valuable asset of your restaurant? Your loyal customers. They are the one who will bring you a constant flow of orders and will talk about your restaurant to their friends and family. Having your own system let you not only avoid paying fees for existing customers. But it also lets you reward them to make sure they are staying and talking about you around them. Protect from competition with your own targeting audience: Competition is more intense than ever online. Customers can easily choose between so many options from the comfort of their home. On aggregators, they are only one click away from competition. Driving them on your own system make them stay with you. Also, by setting up the right analytics and tracking in place you can build your very own pockets of audiences and targetings to keep your best customers with you. Run better: Using your own food ordering system allows you to easily access data and information about your customers and their ordering habits. This is what you need to tailor offers, new meals, and delight them with an amazing customer service experience. Extend reach: Websites are dead! … Well not yet. They are still the #1 reflex for many people when they want to connect with you. But it’s no longer the only one! Many of your customers now get in touch via social media especially Instagram or Messaging apps such as Facebook Messenger and WhatsApp. It’s key you offer them an easy way to order directly from the apps they use the most every day. A good online ordering system lets your customers easily order from where they engage with you.